A few months back, I got involved in a Twitter conversation on knowledge management. I don’t recall exactly how it started but a reference was made to Doctor Who, and then I discovered that several of my followers are Whovians. If you aren’t familiar with Doctor Who, it’s rather hard to summarize quickly. It is a British science fiction show that started in 1963 (and is still continuing!) about an alien who travels through time and space in a time machine called the TARDIS, that resembles a police call box from the outside but is mysteriously much larger inside. It has its own cult following, complete with fans that know way too much about the show. The central character, The Doctor, has been played by eleven different actors, with the convenient conceit being that he is immortal and occasionally “regenerates.”” The best of The Doctors, the Fourth, was played by Tom Baker (1974-1981). Various (human and nonhuman) companions join The Doctor in his travels across the universe fighting the forces of evil. It has the distinction of being listed in Guinness World Records as the world’s longest-running science fiction television show. You can read more about Doctor Who at BBC sites (both the UK and the US sites), on Wikipedia or the fan-based TARDIS Index wiki. After thinking about it a bit, and reflecting on the various tweets, I decided that some important lessons about KM could be learned from watching Doctor Who. The new Doctor is actually very old. While formal recognition of KM as a scientific discipline began in the early 1990s, managing knowledge could be traced back to the mid 1600s and the earliest of apprenticeships. Like The Doctor, organizations have been managing knowledge for quite some time, each new program slightly different than the last. While his face, his voice, his clothes and even his personality changes every so often, he’s still the same Doctor at heart. Knowledge management has changed over time, with new tools and new approaches, but it has always been the same at the core. KM initiatives have to evolve and adapt to the changing times and the business landscape or they become stagnant, ineffective and die. And few KM programs, once they die, can regenerate like The Doctor. In order to get people to do what you want, sometimes you have to offer them a jelly baby. Collaboration and sharing for its own sake is sometimes not enough incentive for some people. Meeting people half way, offering some personal rewards and incentives, and in general, being nice, goes quite a long way. Get along well with the Brigadier. The Third Doctor spent much of his time on Earth and cultivated a great relationship with military leader Brigadier Sir Alistair Gordon Lethbridge-Stewart. It is always a good idea to have good working relationships with people in authority – partners, managing partners, and practice heads. The Doctor was always helping someone out of a jam. Throughout much of the series, The Doctor had little control of the TARDIS, often materializing at random spots in time and space. But wherever the planet, whoever the people, there was some sort of crisis. KM helps organizations effectively deal with difficult situations. A great KM program is indispensable in times of crisis. Your job: identify specific solutions that KM can offer to manage the “challenges” in your firm. KM can do more than it appears. When you do it right, like the TARDIS, KM is bigger on the inside than it is on the outside. It’s not just the data repositories or retrieval abilities or collaboration tools, it’s the totality of the collection working together that makes it larger than the sum of individual parts. 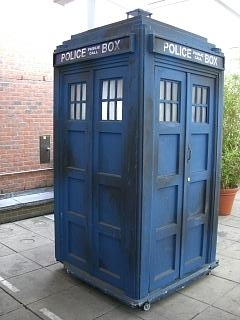 The TARDIS always looks like a London Police Box. With a nonfunctional chameleon circuit, the TARDIS never really blended in with the environments it visited. KM programs need to be a bit more discriminating than The Doctor, who never tried very hard to fix that circuit. The look and feel of our technology tools should not be taken for granted. A mishmash of UIs and buried functionality will severely hamper your progress. If you need a more current time continuum example when it comes to software – look to Apple. Keep your sonic screwdriver handy. screwdrivers, no magic tool that does almost everything we need. So while we may not have our own a K-9 unit (a robotic dog), a sonic screwdriver or a TARDIS, we do have the vast knowledge The Doctor, in all his incarnations, has shared with us. While the path forward for KM may be difficult, we must strive to continue to educate our lawyers and fight for cultural change. At least we can all be glad we aren’t fighting Daleks, The Master, Sontarans, or Cybermen. What other Whovian KM lessons can we learn? A comment that represents ‘old school’ thinking because the more recent series had Daleks flying through the air. The message: KM has to adapt to continue to play an important role in law firms. There will always be a place for taxonomies, metadata and the like but modern iterations of universal search, legal project management etc should be embraced. Unlike the the episode, The Genocide Machine, where the library on the Kar-Charrat planet has technology called the wetworks facility that contains the “knowledge of the universe” that the dreaded Daleks want to download into a Dalek mind for their use, we have no facility to download knowledge. It is true, then, that KM is not easy!